Donald E. Cole went to his heavenly home on Friday, November 16, 2018. He was born on September 14, 1932 in Bucksport, Maine to Manley and Effie (Gray) Cole and grew up in Bucksport until his family moved to North Berwick in 1941. He graduated from North Berwick High School and then enlisted in the United States Airforce where he served four years during the Korean War. Donald worked as a Sonar Engineer at the Portsmouth Naval Shipyard. He was a member of the North Berwick American Legion, the Yorkshire Lodge AF/AM #179 and the Mayflower Society. He was a Deacon at the Bethel Christian Church, which was founded by his father, Manley Cole. 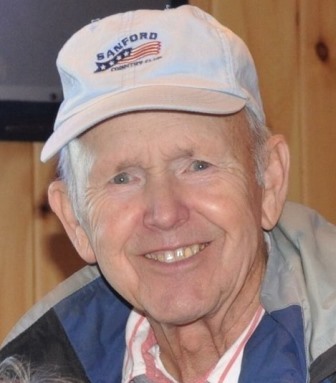 He enjoyed golf and has been a member of the Sanford County Club since 1960. Donald was predeceased by his parents, his three brothers, Freeman, Thomas and Robert Cole and his sister, Selena Post. He is survived by his wife of 63 years, Ruth Cole, his four daughters: Pamela Roy, and her husband, Ron; Joyce Turcotte, and her husband, Steven; Teresa Michaud, and her husband Shane; and Jennifer Berard and her husband, Jim. His grandchildren: Jeremy Turcotte, Sheri Greenhalgh, Abbie Roy, Audrey Paskowski, Chandler Michaud, Natalie Ouellette, Hannah Michaud and Jeffrey Berard and great-grandchildren: Grace, Brayden, Kiko, Leksi, Addison and Lainey. Donald is also survived by two sisters, Frances Sesin and Dorris Emery; his brother-in-law, Robert Babcock and sister-in-law, Barbara Janelle, as well as many nieces and nephews. Services: Visiting hours will be held at Bethel Christian Church, 129 Lower Main Street, North Berwick on Tuesday, November 20, 2018 from 4-7 p.m., where a funeral service will be held on Wednesday, November 21, 2018 at 1:00 p.m. A private interment for the immediate family will take place in the Hillside Cemetery in North Berwick. The family will then return to Bethel Christian Church for a fellowship and celebration of Donald’s life.